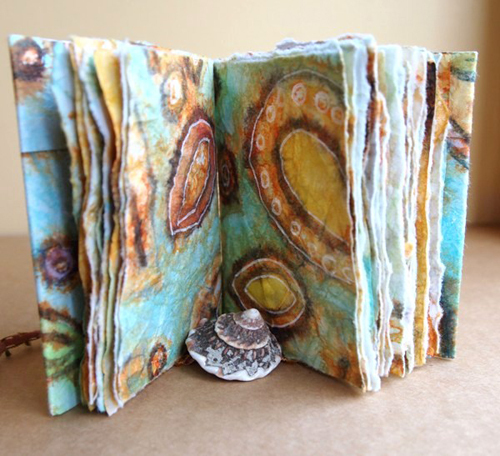 Create two extraordinary “inkly crinkly books”—multi-signature, end band, hand bound books with inked and painted Masa papers. You’ll learn at least five techniques in this workshop including dropped-in color, ink batik lines, Masa paper process, and book binding techniques to stitch signatures with end bands. 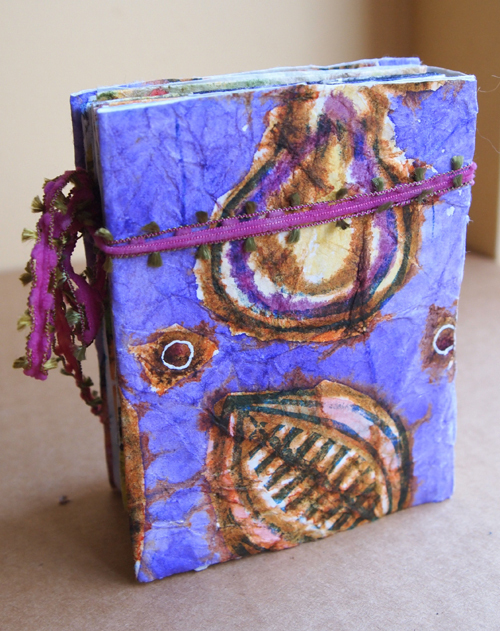 You will explore a special batik-like technique with Masa rice paper to create the folios and cover papers with stamps, acrylic inks and watercolor washes. The paper quality is ever so soft in the finished book…a book you’ll love to pick up again and again. Stamps and stamp pads, foam brushes, brushes for inks, and other tools will be provided to use during the workshop. Helen’s watercolor illustrations have graced the cover brochures, garden articles and advertisements of numerous International resorts and magazines. Awards include four San Diego Press Club First Place Awards of Excellence in Illustration for San Diego Home/Garden Lifestyles Magazine. *$12 materials fee paid at the time of the workshop to the instructor. Add $25 for registration after the earlybird deadline of September 28, 2013. Refund, minus $25 administration fee, for cancellation made by September 28, 2013.